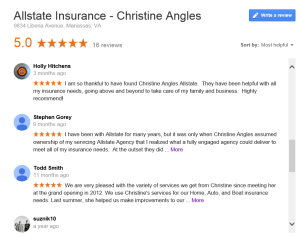 See what customers are saying about our Allstate Insurance Agencies in Manassas and Chantilly! 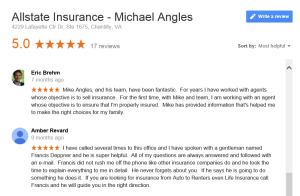 Here at our Manassas Allstate Insurance Agency and our Chantilly Allstate Insurance Agency, we are thrilled about what our customers are saying about us! Thank you for sharing how we have helped you with your car insurance, home insurance, life insurance, etc. Our goal is to get to know our customers, understand their needs, and provide appropriate coverage with the most applicable discounts. Every year we offer an insurance review to make sure as our customers’ lives change, their insurance stays up to date. Plus it is a great time to answer billing questions, update contact information, etc. We offer our annual reviews in our agencies (9834 Liberia Ave., Manassas, VA 20110 and 4229 Lafayette Center Drive #1675, Chantilly, VA 20151) or over the phone. Our team member, Francis Deppner, enjoys boating. You can catch up with him on the weekends at Belmont Bay Marina or during the week at our Chantilly, VA Allstate Insurance Agency. 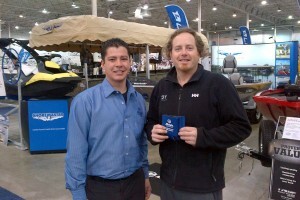 Here he is with Bobby from Dominion Yachts at the National Boat Show this Spring. Dominion Yachts has a great inventory for a boat purchase. Visited with a class at Westfield High School today in Chantilly, VA to teach insurance basics in the required Economics and Personal Finance class. 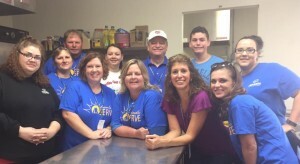 Enjoyed sharing information about the home insurance, auto insurance, umbrella coverage, etc. These should be well informed Allstate customers in the future! This is a great time to review your boat coverage to make sure your boat is also protected. To review your boat insurance or for a boat insurance quote, stop by our Manassas, VA or Chantilly, VA Allstate insurance agencies.